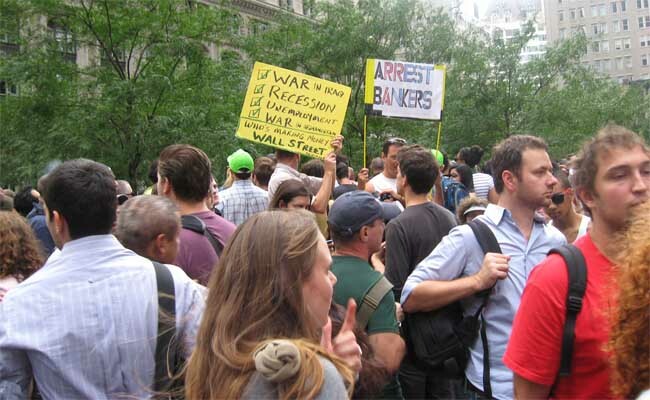 The crowd density at Occupy Wall Street had thickened quite a bit from earlier in the week. Here’s a photoessay from Friday afternoon. 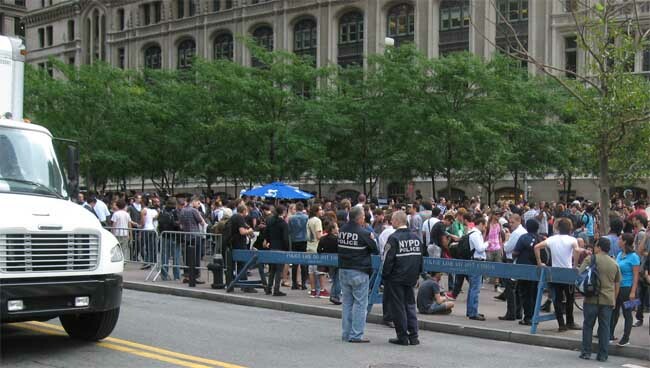 On Friday afternoon, the crowd density at Occupy Wall Street had thickened quite a bit from earlier in the week. Many of the new attendees were journalists. I counted close to thirty media types as I canvassed Zuccotti Park, watching TV vans and cameramen and reporters taking notes on their notebooks and BlackBerries. I saw NY1, CNN, Slate, a concatenation of outlets I had not seen when I hit the park on Tuesday. 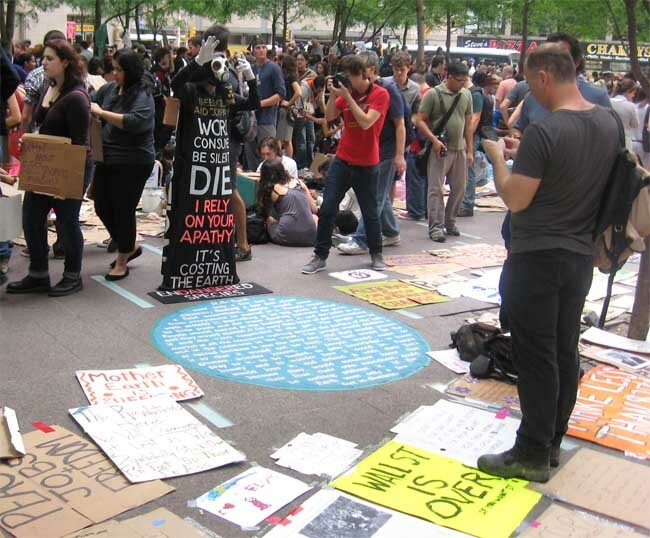 I hit Zuccotti Park in the late afternoon: just before a march upon NYPD headquarters. I estimated the crowd at a few thousand. More poured into the park, some lured by the prospect of a rumored Radiohead appearance at 4PM. While the park’s perimeter remained open to pedestrian traffic and the cops remained fairly calm (perhaps due to the heightened media), I wondered it the increased media attention would cause more people to come, testing the limits of occupation. I also wondered what plans the NYPD had in store. Cops clad in riot gear? By now, a hackneyed effort to intimidate. Yet across the street from the park, I noticed a badly dressed undercover cop, wearing sunglasses and very much on his own, feebly pretending to be an activist with brand new crutches and a limp that didn’t match the way he was clutching his aluminum. When attending a large-scale event, it is often my practice to stand in one spot and listen to the surrounding people. 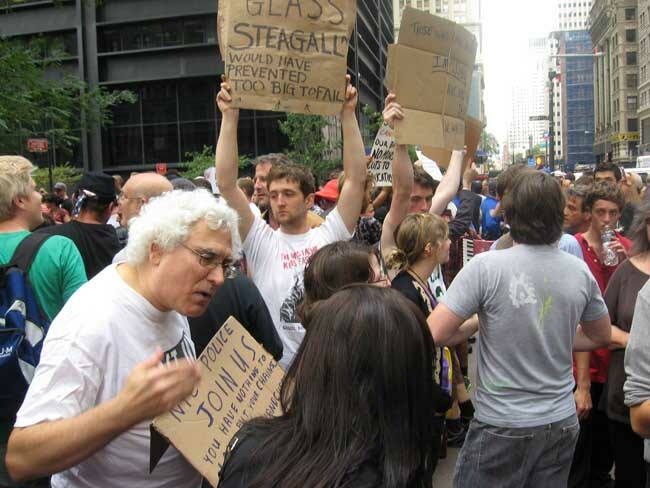 The protesters were fully aware that they were putting on a show. Many greenhorns — some considering themselves journalists — had come to gawk. Their intent was to document. They wondered why these people were still sticking after two weeks. Some of the bona-fide journalists appeared to be mystified about why they had been assigned this story. If these slogans and sentiments on cardboard and posterboard appear flip and cliched, what then is the best method to get a message across? In recent days, there has been a modest debate about whether the protesters should dress up and improve their aesthetic. 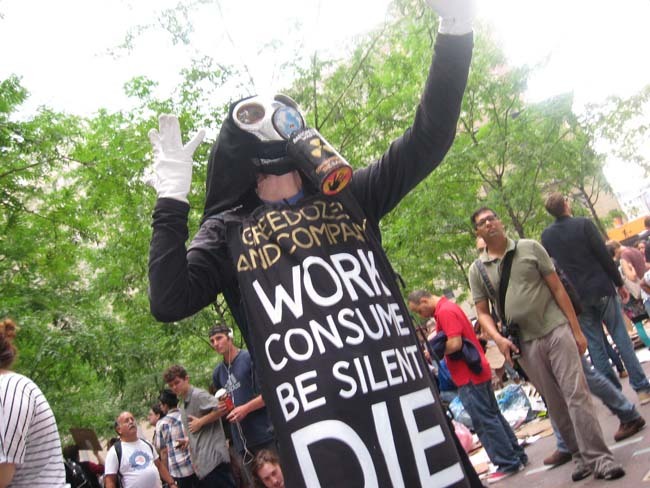 I hope you choke and die- your corporate masters will be happy with their lap dog but in the end you are just a slave- no matter how proud you are of it- you are just a slave. It’s about time this event is being brought to light by the media. Corporate controlled affiliates were under mandate to ignore and prevent any attempts of the event to come to be known beyond New York. Fortunately independent journalists document and share the protest’s effort with the rest of the world. It’s good to bring the greed of bankers and corporations into more light and do everything possible in a non violent manner to embarrass and degrade the Congressional favorites in terms of support, financial breaks and favorable legislation. Is D.C. next? This protest is wonderful. I am thinking of taking a week off to join in. I am 57 and this would be my first demonstration. This news has not been in our paper here in Cleveland and that shows where the media stands. Wish I could be there. We need more protests like this. Maybe if it spread across the country those traitors in congress would get the message. The Biggest problems in the USA can be traced to 3 key things, Greedy Hospitals, Greedy insurance companies, Greedy Pharmaceuticals… where this stand on Wall Street is noble and by no means am I expressing they should leave…. (for yes, it’s painful, to wake up and realize that greedy stunads wont trickle down their profits as they been granted tax breaks to do so. So stay and bring that cause to light) BUT, take note, the *real evil* is people profiting on the suffering of others… this is the first that needs to change. We also got a war waged between the Medical World and the Insurance World, that has lead to costs being wildly overblown!! &&& Since when should peoples lives be an INDUSTRY?? Sell your phones, sell your PC’s Cola, Mc-D’s you can choose to buy them or make a valid point and choose not to. But make it a point to have a 1# problem with this; that when a person is in pursuit of survival, someone is using them as a key to profit!!! Someone is billing them enormous fees, someone is capping them and someone is then taking their home. The movement is gaining momentum in it’s THIRD week now and Occupations are popping up all over the country! Stand up together and use your voice to give to those without through peace and solidarity. Tax the rich and feed the poor- you are the 99%! 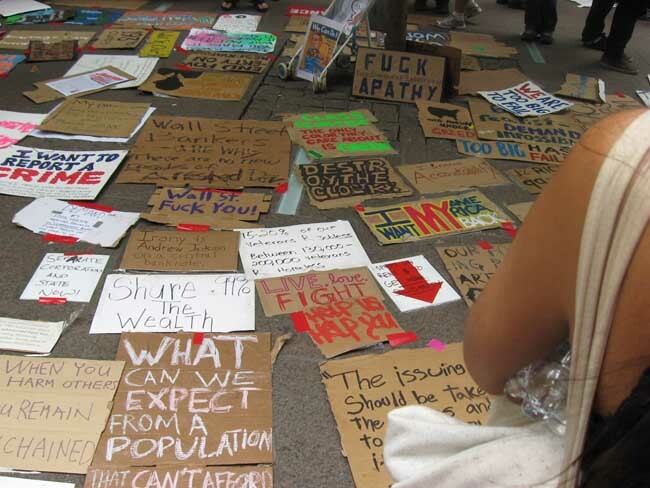 See my Occupy Wall Street painting and Anonymous homage on my artist’s blog at http://dregstudiosart.blogspot.com/2011/09/occupywallstreet.html where you can also see videos of the protests and police brutality as well as get other sources for coverage of the movement. I am glad this is getting the attention it deserves. I left my career directing beauty advertisements in Hollywood to join this fight. My gut has never been wrong, we are amidst a revolution and I’m 100% behind it’s cause.